I apologize for the lack of posts recently. I have been a little busy and rather distracted with my newborn son, Noble. He was not due until the end of August, but decided to make an appearance a few weeks ago. Due to an unplanned last minute c-section, I have not been able to spend much time in the kitchen, but am finally ready to be baking again. 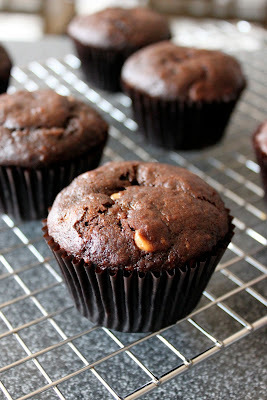 I decided my first attempt baking post baby would be these Chocolate Banana Muffins. You may think this is an odd choice if you have followed Baked Perfection for any amount of time, as you know that I do not like bananas one bit. Well, apparently giving birth can also change your food preferences. I did not have a single craving during pregnancy and yet here I am a couple weeks post delivery, eating a banana almost everyday. As for Noble, he is absolutely perfect and Zack and I are completely in love with him. In fact, it seems just about everybody we know loves our son as much as we do. We are lucky to have such wonderful family and friends to be part of our and Noble's life. Preheat oven to 375 degrees Fahrenheit. Line a muffin tin with baking cups and set aside. In a large bowl mash the bananas with a fork then mix in the sugar, vanilla, egg, and oil. In a separate bowl whisk together the flour, cocoa, salt, baking soda, and baking powder. Gently fold the flour mixture into the banana mixture. The batter should be just moistened, do not over mix. Gently stir in the chocolate and peanut butter chips. Divide the batter between the prepared muffin cups and bake for 18-20 minutes until a toothpick inserted into the middle comes out clean. Transfer to wire rack to cool.